Great matches: Liverpool beat Roma at their own ground! - LFChistory - Stats galore for Liverpool FC! Great matches: Liverpool beat Roma at their own ground! Liverpool's 4th European Cup final in 8 seasons took place in the 'Eternal City' of Rome, the scene of their famous first triumph in 1977. But the circumstances were very different from that memorable day when the club became champions of their continent for the first time. Because this time they had the enormous disadvantage of having to face opponents who played their home games at the Olympic Stadium. Roma were not the first club to play a European final on their own ground and probably won't be the last now that final venues are announced up to 2 years in advance. However, for what was always meant to be a 'neutral' venue, it was clear that this was one of the biggest tests ever faced by Liverpool, despite their stature as probably the most dominant force in European club football over the previous decade or so. The club's path to the final had been a varied one, starting with a comfortable 6-0 aggregate victory over the Danes from Odense. But Athletic Bilbao forced a goalless draw at Anfield before an Ian Rush header out in Spain brought the only goal of the tie. Coming away from Bilbao with a victory after failing to score at home showed the sort of resilience of which this Liverpool team was made and they would need all of that and more if they were to overturn the odds stacked against them in the final. Old adversaries Benfica were disposed of 5-1 on aggregate in the quarter-final before two bruising matches against Dinamo Bucharest saw the Reds safely through to the final. Although their task was daunting, it was encouraging that all four away legs had been won on the way to the final, with 8 goals being scored and only 2 conceded. For a while there was a chance of an all-British final; Dundee United had reached the semis and actually beat Roma 2-0 in Scotland but subsequently lost 0-3 on the same afternoon that Ian Rush scored twice to silence the hostile crowd in Bucharest. Phil Neal was the only survivor of the 1977 team. It was remarkable how Bob Paisley (and then briefly Joe Fagan) had made only gradual changes to their teams which never disrupted or threatened Liverpool's position at or near the top of English and European football. Apart from Neal, there were four other survivors from the the 1981 final in Paris - Alan Kennedy, Alan Hansen, Kenny Dalglish & Sammy Lee. The rest of the starting eleven had substantial experience of big match occasions, of which there had been many as the club had just won the domestic title for the 3rd season in a row as well as winning the League cup 4 years running. Despite Liverpool's pedigree, Roma were overwhelming favourites. For the home supporters, there could be no other result. Thousands of them were already wearing scarves and waving flags which declared their club to be the champions of Europe! But their players seemed more nervous as the teams walked out to a sea of flares and a a wall of noise. It was learned later that the Liverpool players had been singing as they waited in the tunnel before walking out and it was clear from the reaction of their opponents that the Italians could not believe that a team could be so relaxed before such a big game. Normally, Liverpool's 'game-plan' might be to try and quieten the home crowd by being patient and taking few risks but in a one-off final in their opponents' stadium it seemed likely that they would have to take some chances as only a supreme defensive performance was likely to keep such opponents out for up to a hundred and twenty minutes. Liverpool made the sort of start that they could only have dreamed about beforehand, taking the lead after just 15 minutes. The home goalkeeper Tancredi went up for a high cross hoisted by Craig Johnston from around the right-wing area and whilst many referees - in such an intimidating atmosphere - might have been tempted to blow for a foul, thankfully Mr. Frederiksson from Sweden was not swayed by the home supporters. The ball ran loose from the goalkeeper's grasp and was then driven back against his head by a defender trying to clear the danger. The ball broke kindly and Phil Neal was in the right place to place a neat shot into the unguarded net. For a fraction of a second, players and supporters needed confirmation from the officials before they could celebrate such a priceless goal. It was too early to try and defend that precious lead without any further attempts to increase it and the Reds could with a bit of good fortune have been even further ahead, Tancredi making a couple of good saves to keep the Italians in the game. But just as it seeemed that Liverpool had safely negotiated the first 45 minutes, disaster struck when Conti got away from his marker close to the dead-ball line on the left and his cross was headed over Grobbelaar by Pruzzo. Despite playing at 'home', the Italians seemed at times to be more concerned about not conceding another goal than scoring one themselves. The second-half was tense and not without chances but perhaps it was no surprise that full-time was reached with no further scoring. Nor were there any more goals in extra-time, which saw Michael Robinson replace Kenny Dalglish and Steve Nicol taking over from Craig Johnston, two decision which were to be of great significance when it came to the penalty shoot-out. Kenny would surely have been one of the nominated five takers but, as he had been substituted, his part in the game was over; and young Nicol would not then have had to 'volunteer' to take the first, vital kick - which he subsequently blazed over the bar to give the Romans an immediate advantage! But Italian international Conti missed his club's second kick which meant that the score was 2-2 after each team had taken three penalties. It had reached the critical stage where someone would emerge as either hero or villain. Ian Rush cooly placed his shot low into the corner and when Graziani - possibly put off by Bruce Grobbelaar's antics on the line - drove his kick against the bar and over, it meant that if Liverpool could convert their 5th and final spot-kick then the cup would be theirs. Alan Kennedy stepped up with it seemed more belief in his own ability than some of his colleagues shared and calmly drove the ball left-footed away from Tancredi's right side before wheeling away in triumph to be engulfed by delirious team-mates. This was the final game Graeme Souness played in a Liverpool shirt before moving to Sampdoria in the summer. He was an inspirational captain and someone you would always want on your side when the going got tough. He proudly stepped forward to receive the giant trophy before Liverpool embarked on their lap of honour in front of a stadium that was emptying fast as the home fans left, unable to disguise their disappointment and even anger that they had been beaten. Many Liverpool fans were the victims of cowardly assaults as they tried to find their transport after the game and the atmosphere was even more hostile than it had been before the match, when the good nature of the Roman fans was caused partly by their belief that their team only had to turn up to win the final. As Liverpool's players, staff and supporters celebrated their momentous achievement, enormous bonfires were lit on the outskirts of the city in the small hours of the following morning to destroy the thousands upon thousands of items of merchandise that had already been made and printed declaring that Roma were the European champions! AS Roma: Tancredi, Nappi, Bonetti, Righetti, Falcao, Nela, Conti, Cerezo (Strukelj), Pruzzo (Chierico), Di Bartolomei, Graziani. 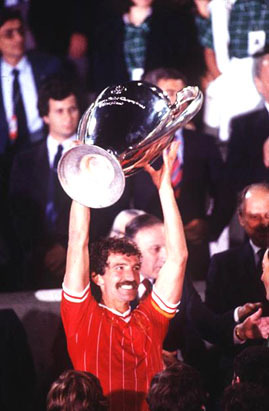 Liverpool: Grobbelaar, Neal, Kennedy, Lawrenson, Whelan, Hansen, Dalglish (Robinson), Lee, Rush, Johnston (Nicol), Souness.